On April 2 several industrialised and emerging market economies will meet at the London summit. Slowly, the policy positions of participating countries are emerging and give an overview of what might be the outcomes of the meeting. This paper gives an overview of official standpoints of participating countries ahead of the summit on a variety of topics and, taking that into considerations, provides an overview of what is likely to be agreed on in the end. Eduardo Gudynas argues that the financial crisis reveals a profound crisis of the multilateral governing system. Bretton Woods 2: What should be on the agenda? What roles should twenty first century international financial institutions (IFIs) play, and how should they be structured? This paper sets out some of the key issues that would need to be resolved at a second UN monetary and financial conference - a 'Bretton Woods 2' - and discusses the road ahead. 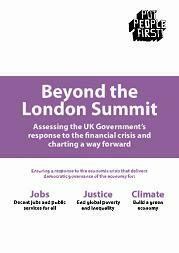 On 28 October, more than 40 representatives of NGOs, development organisations, labour unions, think tanks, academia and the media came together in London to discuss how to take forward demands for a fundamental redesign of the international financial system. The main themes for the day were about creating a system that works to improve people's live, reduce poverty, and protect the environment. The consensus among civil society observers was that the agreement struck at the December Hong Kong WTOtrade ministerial was a bad deal for developing countries, with IFI-backed 'aid for trade' used as a "major distraction". Details of the BWIs aid for trade package were unveiled at the annual meetings, as officials turned up the pressure to reach a deal at the upcoming trade summit in Hong Kong. Highlights of a civil society meeting on trade-finance linkages in Latin America, 20 April 2006, Washington. Hosted by the Center of Concern. The sixth annual conference of the Parliamentary Network on the World Bank will be held 21 - 23 October in Helsinki, Finland. The Global Transparency Initiative will be holding a three-month consultation starting 28 September, on a draft charter of transparency principles which the international financial institutions should uphold. The Integrated Framework for Technical Assistance to the Least Developed Countries (IF) is a multi-agency initiative to coordinate national ministries, donors and multilateral agencies in the provision of trade-related capacity building. A new book by two researchers at the University of Oslo describes the structure and decision-making processes of multilateral institutions.